This is the updated version of 'the' teacher training course for teachers and trainee teachers preparing for the Cambridge ESOL Teaching Knowledge Test (TKT). It includes everything you need to prepare for the test. 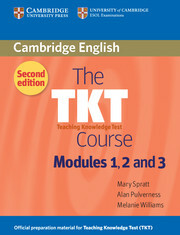 The second edition contains three brand new model TKT practice tests, new tips for preparing for the TKT, an additional unit on approaches to language teaching tested in the TKT, completely rewritten tasks in every unit, and revised ELT terms and concepts matching the latest Cambridge ESOL TKT Glossary. This best-selling course has been written in collaboration with Cambridge ESOL by a team of experienced TKT writers. It provides a comprehensive and reliable package for TKT candidates, as well as for teachers preparing for other initial teacher training qualifications and those on in-service training programmes. This course is also available in an online version. Select 'TKT Online' from the menu on the left for further information.